STC employees design and manufacture electronics for a wide range of advanced-technology businesses. Our customers range from some of the largest brand manufacturers to smaller leading-edge technology shops. Our electronics products are shipped worldwide, and they provide key functionality for important parts of everyday life in those locations. Join our team to be a part of this innovative environment. Click the following link to open a copy of the STC Employment Application in a new tab. Applicants are welcome to email completed forms to Angie Calkin at acalkin@suntransformer.com. You may also bring completed applications to STC at the address shown on the left. STC, Inc., a manufacturer of transformers & PCB assemblies is accepting applications for a full-time Assembler Trainee. Work involves operations with extremely fine wire and tiny components to high workmanship standard. Resumes or inquiries may be emailed to Angie Calkin <acalkin@suntransformer.com>. STC, Inc., a manufacturer of transformers & PCB assemblies for a variety of industries, including Aerospace, Military, Broadcasting, and Traffic Management is seeking candidates for an Electronic Technician. Assemble and test SMT printed circuit assembly prototypes. Use ATE and various measuring/diagnostic tools to test components and subassemblies. Devise test equipment setups and circuitry to conduct functional and environmental tests to evaluate RF and embedded processor product performance. 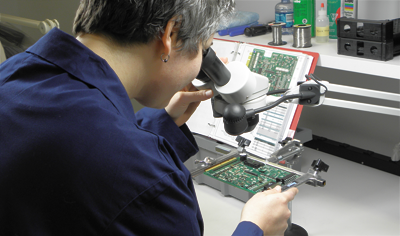 Troubleshoot printed circuit assemblies using DMM, Oscilloscopes, and RF test equipment. Follow ISO 9000 Quality System procedures. Associates Degree in electronics or equivalent industry experience is required. Have experience using electronic test equipment. Be able to read and understand technical drawings, datasheets, and written work instructions.Excellent attention to detail is highly important as many products are employed in high reliability applications. Must be able to pass a corrected near vision and color vision test. Have good verbal and written communications skills. Competitive compensation is offered with benefits including health, dental, and vision insurance, pension plan and paid holidays. Resumes may also be emailed to Angie Calkin <acalkin@suntransformer.com>.